When shipping or traveling with specialty items such as expensive equipment, tools, and collectibles, the type of packaging you use is of paramount importance. Pack the items too loosely, and they become vulnerable to damage from shaking, jarring, and rough handling. Pack the items too tightly, and they may bend, warp, or become difficult to remove from the case or box. Neither of those situations is ideal, which is why custom packaging is the way to go. Here’s a brief overview of three types of custom packaging available from The Foam Factory. If you’re comfortable with DIY projects and are handy with an electric kitchen knife, then you can create your own foam packaging for fragile items. 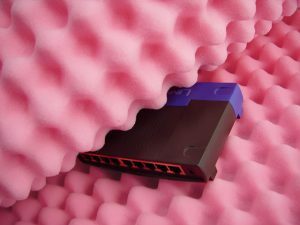 The Foam Factory recommends charcoal foam sheets in regular or firm density for common packaging applications (think cameras and guitars), and eggcrate foam or antistatic foam for specialty applications (think electronic equipment or sensitive computer components). Once you order the desired foam, you can fit the foam to the box, case, or display, and then trace and cut out the shapes of the items you wish to pack. If you’d rather not deal with the hassle of cutting foam sheets, pick and pull grid foam is a terrific alternative. Pick and pull grid foam is made of open-cell foam and is available in varying thicknesses beginning at 1/2” and going up to 3”. This pliable foam comes in perforated sheets divided into 1/2” squares, which can easily be separated from each other by hand or with the help of scissors. By using pick and pull grid foam, you get an incredible amount of flexibility and control over the level of protection for items of nonstandard shapes and sizes. For the ultimate in protective packaging, consider ordering custom foam inserts from The Foam Factory. You can choose from any type of foam we carry, including open-cell, closed-cell, antistatic, and eggcrate, and we’ll cut it to your precise specifications whether you’re ordering a single insert or several thousand. Some of the products we’ve helped our customers protect include remote control helicopters and drones, musical instruments, weapons, professional grade cameras and accessories, electronic devices, tools and equipment, and medical supplies. When it comes to transporting fragile items, don’t trust your valuables to ordinary packing peanuts and bubble wrap. Instead, be sure to use DIY foam sheets, pick and puck foam, or custom foam inserts for the best protection at a great price. My brother has a collection of vintage cars and he wanted it kept in stored in perfect condition. It was explained here that there are businesses that can manufacture foam inserts for protective packaging. Moreover, it’s advisable to go to trusted manufacturers for custom foam packaging. A cost effective solution may be to use our pick n pluck foam for your application. Link to our pick and pluck foam is here.